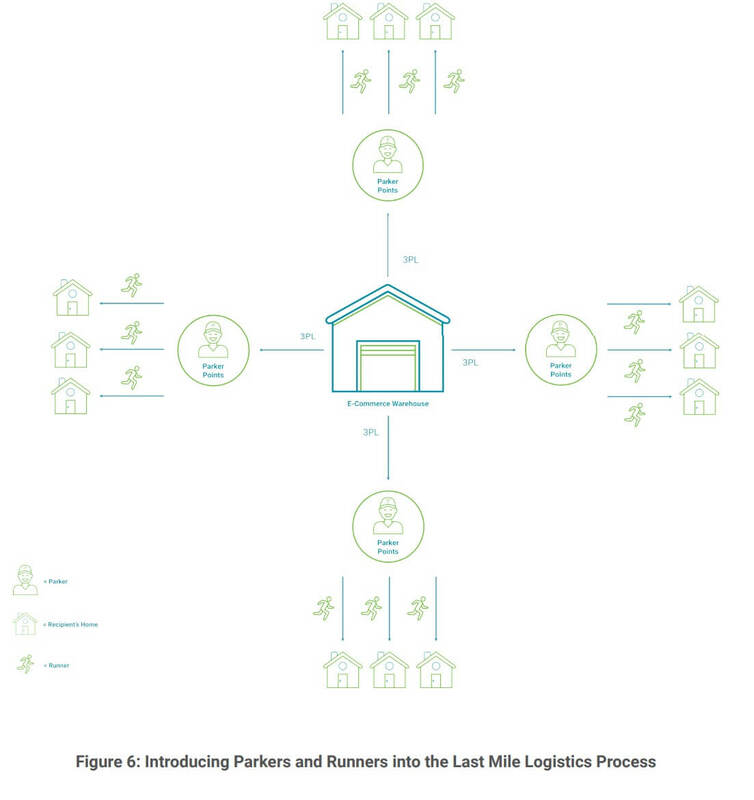 LogisticsX aims to develop a decentralised blockchain network with the vision of connecting global logistics stakeholders including e-commerce retailers, third party logistics (“3PLs”), individuals managing Parker Point (“Parkers”), individuals couriers delivering parcels (“Runners”) and parcel recipients in a multiparty trust free network as shown above in figure 2. We intend for our first partner to be Park N Parcel, due to its strong extensive network with logistics stakeholders. How does Park N Parcel work? Park N Parcel recruits neighbours and neighbourhood retail shops as parcel collection points (“Parker Points”). As of May 2018, the numbers have grown to a vast network of more than 1500 Parker Points across Singapore alone. Park N Parcel aims to further expand their network of Parker Points across Asia. 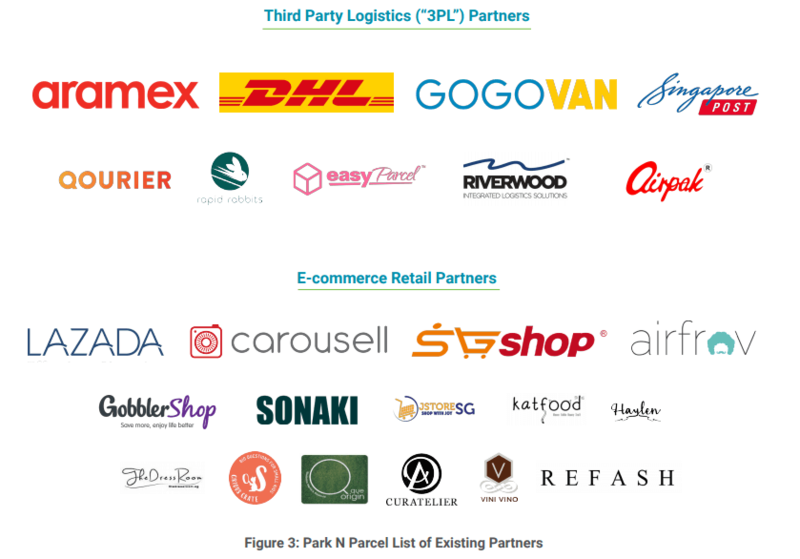 Additionally, Park N Parcel has been serving major stakeholders which consist of international third party logistics companies and E-commerce retailers, which includes more than 30 merchants and a community of 2000 online sellers. There are direct technical infrastructures with their existing partners to obtain instant logistics booking details, to receive immediate notification of the parcel status and volume estimation which ensures a smooth and efficient end to end parcel delivery. LogisticsX aims to transform the last mile delivery sector by increasing security and transparency while reducing the fragmentation between logistics stakeholders. How will LogisticsX change the Last Mile Delivery Sector? LogisticsX will introduce the concept of freelancers delivering parcels on an adhoc basis (“Runners”) between the collection points and end recipients. Freelancers may also opt to use free spaces in their homes or shops to operate parcel collection points (“Parker Points”). Figure 4 below shows the traditional model, where there is only an average of three (3) stakeholders in each end-to-end parcel delivery from collection point A (Retailers) to delivery location B (Recipient). LogisticsX believes that increasing the stakeholders involved in a each parcel delivery order will make the process more efficient. This is due to the rise in sharing economy where individuals are able to perform collection or delivery services at their convenience, which increases manpower during peak delivery periods. 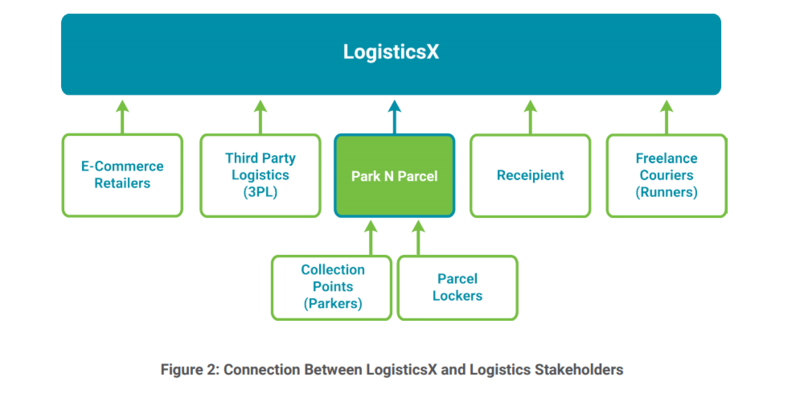 As depicted in Figure 5 above, LogisticsX will aim to utilize the network of Parkers and Parker Points as provided by Park N Parcel. This will serve as the backbone of the decentralised last-mile logistics network that LogisticsX will be building. Parkers are introduced into the end to end parcel delivery process to house parcels near to the final address of the end recipient. In the event of a missed delivery, the 3PL can deliver it to the nearest Parker Point operated by Parkers instead of going back to the 3PL warehouse. They can then instruct the end recipient to collect it at the Parker Point, which saves the need and cost for redelivery. Additionally, with parcel tracking information being distributed on blockchain, Parkers would benefit from the adoption of LogisticsX. They would have access to real-time overviews on the status and detail of the parcels, which might previously have been unknown or unavailable to them, since 3PLs do not usually furnish such information to Parkers who are not final recipient of the parcels. This improved transparency for Parkers may allow them to plan their space and inventory with greater efficiency. With the rise of sharing economy, LogisticsX will introduce the concept of freelancers delivering parcels on an adhoc basis (“Runners”) between the collection points and end recipients. This aims to reduce the time taken for each parcel to be delivered. For Runners, LogisticsX will either build its own network or leverage on existing sharing economy platforms. Runners are intended to provide the last leg of delivery to the recipient doorstep. For example, when the recipient is home and wishes to have his parcel delivered to him within the next hour, a Runner would be notified of this job within the LogisticsX mobile and web application and would fulfill the delivery. Recipients may use real-time tracking through the geo-positioning of the Runner to provide greater transparency of tracking the parcel. LogisticsX will utilise multiple technologies to establish an optimum ecosystem for Trustless Connect and the various stakeholders involved. It is planned that the initial deployment of the LogisticsX system will be a Decentralised Application (“DApp”) on the ICON Foundation (“ICON”) Blockchain. This will provide full interoperability with partner networks such as Blue Whale Foundation (“Blue Whale”) Blockchain. This will be further explained below. LogisticsX architecture will consist of multiple components to enhance modularity for reusability across the core three applications – LogisticsX Mobile and Web Application, Park N Parcel Application, and the LogisticsX API Endpoints. LogisticsX will setup a mobile and web application to streamline relevant communications for users of the LogisticsX ecosystem, this will target Parkers, Runners, and parcel recipients. Apart from existing delivery and collection activities, the DApp-esque functionalities of our platform will empower users of the ecosystem with the ability to access their token store, contribution and activity statistics, and more. In order to ensure rapid rollout across all platforms, LogisticsX network will be aiming towards a common codebase compatible across iOS, Android and desktops, with a Rails RESTful API backend. It is planned that Park N Parcel’s application will also be setup as a DApp which connects to the Trustless Connect component of the LogisticsX Blockchain, where creation of parcel data and timestamping as the parcel moves from one party to another will be done. The DApp will write to and read from the LogisticsX Blockchain through a series of secure RPC/IPC/API calls, and through these updates users will be able to know in real time where their parcel is, who is holding their parcel, and when they can expect their parcel to arrive. LogisticsX API endpoints will also be made available for small-medium sized partners or merchants who would like to programmatically access the services in the LogisticsX Ecosystem, but are unable to host a full node by themselves. Easy to use HTTP based APIs are being provided to allow individual retailers to easily integrate with the LogisticsX Ecosystem, and as and where required, JSON compliant data can be returned for further parsing and processing as required by larger merchants or partners. LogisticsX blockchain network will be the system that will hold everything together. It will facilitate transparent and secure access to logistics and parcel tracking through Trustless Connect. It will also be the gateway to the Blue Whale through interoperability supported by ICON, where LogisticsX will utilise the Contribution Activity Manager and Reward Bank for the ecosystem. At this current juncture, LogisticsX will be developed as a DApp running on top of ICON. 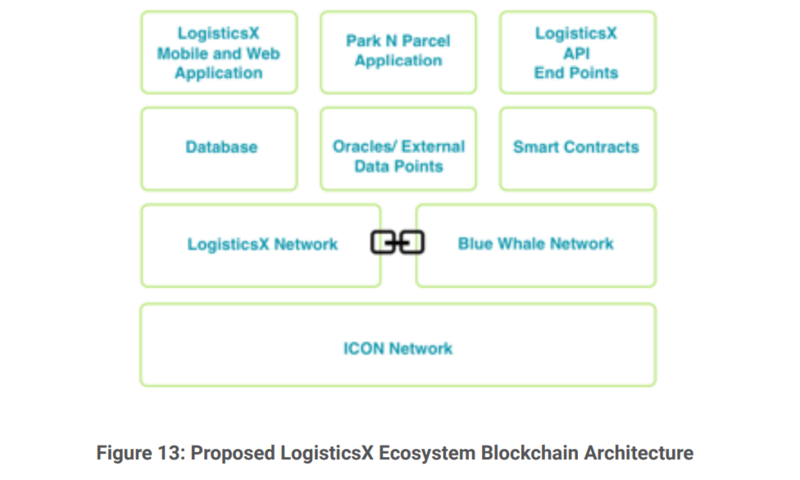 As ICON allows interoperability between blockchains, this will allow LogisticsX and Blue Whale to communicate, instead of providing blockchain spawning (i.e. Arbor Child Chains or Side Chains). Hence, the relevant architecture and transaction fees for all activities on LogisticsX will be tied to ICON’s incentives and economics design based on the ICON. For example, LogisticsX DApp will follow the Loop Fault Tolerance(“LFT”) consensus algorithm used by ICON. For more details, kindly refer to section 3.9. Presently, there is no indicative transaction fee for the ICON network based on the ICON Whitepaper and Technical Documents. This may be subject to future changes to the ICON network. All front facing components, namely LogisticsX Mobile and Web Application, LogisticsX Application, and LogisticsX API Endpoints will connect to the LogisticsX Blockchain to send and request for updates. As mentioned earlier, it is anticipated that Blue Whale will be a key solution partner. LogisticsX will aim to tap into Blue Whale network to gain access to their Contribution Activity Manager and Rewards Bank module. This will provide freelancers on the LogisticsX with the potential for employment benefits. The connection between LogisticsX DApp and Blue Whale Network DApp is possible due to the interoperability that ICON provides. In order for LogisticsX to allow for intake of external information as required by our other logistics stakeholders such as e-commerce retailers (e.g. stakeholders may use RFID scanners, which acts as an external data point that calls to spawn an equivalent parcel on the blockchain with relevant metadata). There are various components of the LogisticsX that will be developed using smart contracts. An example is the tokenized representation of parcels on Trustless Connect.